So here's a thing some smart nerd came up with: Did you know that you can take a PlayStation 3 DualShock3 controller and attach it (physically) to an Android phone, turning it into a gaming console? Ok, that's pretty awesome. But there's a hitch: where do you put your phone if you're using the controller? The GameKlip™ is made out of a special, incredibly strong, blend of premium plastic, similar to the materials used in bullet proof glass. 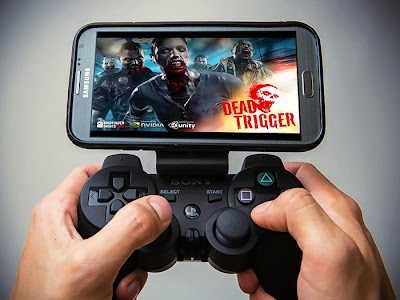 It is flexible enough to easily snap onto your DualShock3 controller but strong enough to provide a solid mounting platform for your Android phone. So, it's a simple clip that attaches to both your phone case (they recommend using a spare one since it will be attached permanently) and to the DualShock 3 controller. If you're phone is rooted, you can play wirelessly with the Sixaxis Controller app. If you're not rooted, you just connect your phone and the controller with a wire. Basically, it's a hack for a hack. Hack-ception! (Yeah, I went there.) Brilliant in its simplicity. Would you believe it was rejected from KickStarter? Seems to be doing fine on its own though.